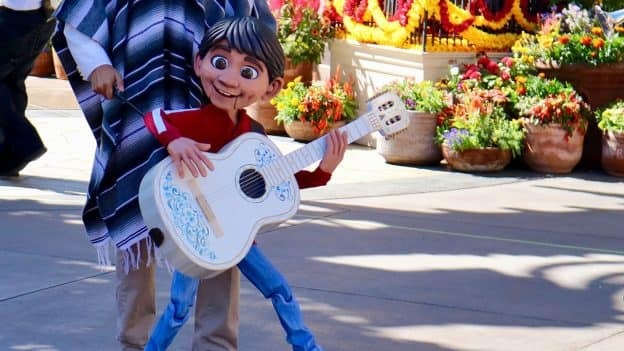 Disney Parks Blog has announced that starting March 6, the vibrant music of Disney•Pixar’s “Coco” will be coming to the Mexico pavilion, courtesy of the amazing Mariachi Cobre. The immensely talented musicians of Mariachi Cobre are joined by a pair of Folklórico (traditional Mexican folk dance) dancers to tell the tale of Miguel Rivera, his love of music, and his journey to find what matters most – his familia. The dancers perform to the music of the film, pulling everyone into the celebration, and Miguel himself appears in the form of a whimsical, hand-crafted puppet. Mariachi Cobre will present the story and music of “Coco,” beginning March 6 during the Epcot International Flower & Garden Festival.